Isn't it funny how you buy something that you know you're just going to change completely? 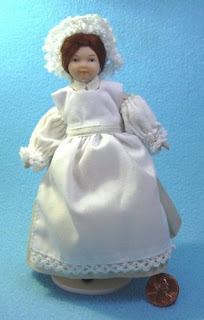 Long dress and full pinny, dark hair and a cap (bald under that cap though! ), and sleeve protectors. All perfectly acceptable... but not for my dolls house. I just liked the look of her face... so that's why I bought her. So... I got her home and ripped her hat and hair off. The sleeve protectors were a no-no, and also the full pinny. Collar on that dress?... not a chance! As for the length... way too long. But she had cute bloomers on that could stay. Her hair was replaced with blonde mohair - twice! Never again... that stuff gets everywhere! The dress was shortened, the collar removed and the neckline widened... no pinny - just a purple ribbon instead and we were almost there. Except for those legs. She had flat feet with painted black boots on. No good at all for curling up on the sofa to read a book, or settling down on a blanket to fuss the dogs. No... they had to go. So I ripped them off. 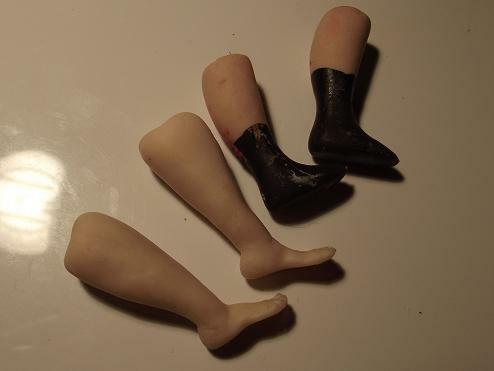 The major problem here, of course, is that I have no idea how to sculpt feet and legs. 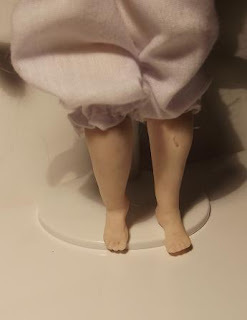 I knew I wanted chubby legs with small feet (just like mine!)... but that was about it. Last night I couldn't sleep - probably the thought of that doll laid on the table with no legs! So up I got from my bed, into the craft room, found some pink skin-tone clay and tried to make something... anything that might ease the guilt. The leg-making and feet-sculpting was so hard - but not nearly as difficult as trying to keep them the same size! 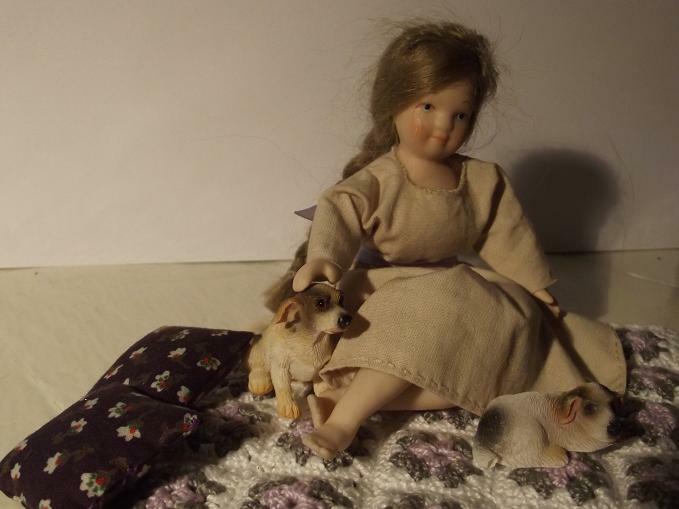 I did it though... and for an old lady whose got rheumatoid arthritis and is a complete amateur, I reckon I did alright... and the doll seems quite happy too. The originals and the replacements. 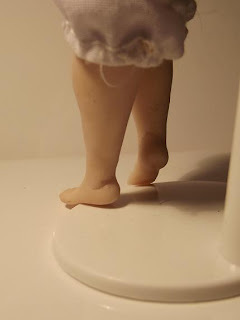 The new legs look bigger - but from heel to top they are about the same length as the older legs. Thankyou for your lovely comments on my blog, I will enjoy following your blog too, I love the way you have rebuilt your dolly!